Rather than sit home idly and covet thy neighbor’s Record Store Day release of The Big Lebowski Soundtrack (White Russian Edition), I decided to crack out the soundtrack to the 1970 film Fools, which features some out-of-print tunes from Lebowski soundtrack stalwarts Kenny Rogers and The First Edition. We see the band at a bit of a crossroads here as some tracks are billed to the entire band, and one track credited to Kenny Rogers solo. The solo track “Someone Who Cares (Love Theme)” is very much the silky smooth AOR Kenny Rogers that he would ultimately be associated with. On the Main Title track gone is the blue-eyed psych of “Just Dropped In (To See What Condition My Condition Was In)” and in it’s place is an orchestral American Folk based ballad “A Poem I Wrote For Your Hair.” The group gets back to it’s New Christy Minstrels roots with a three-part harmony verse full of breezy tones and autumnal lyrics. Kenny Rogers earns his top billing at the 1:54 mark by cutting into the studio magic with his steadfast crooning with juuuust the right bit of tension. A man among boys. The second track here “If You Love,” is a duet between Katherine Ross and Mimi Farina (Joan Baez’s sister). It feels a little outdated for 1970, but never the less an intriguing combination. I’m not sure if this song is performed by Ross in the movie or just a vanity contribution, because the movie seems impossible to find. The hard-to-find nature of the film coupled with Roger Ebert’s scathing review has recently made this a holy grail movie for me. 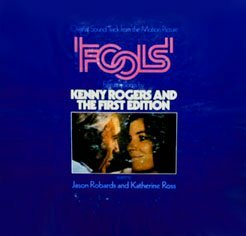 Posted in Uncategorized and tagged Fools, Fools 1970, jason robards, just dropped in, katherine ross, kenny rogers, kenny rogers and the first edition, mimi farina, roger ebert, the big lebowski, white russian edition on December 2, 2014 by mgroesch2014.